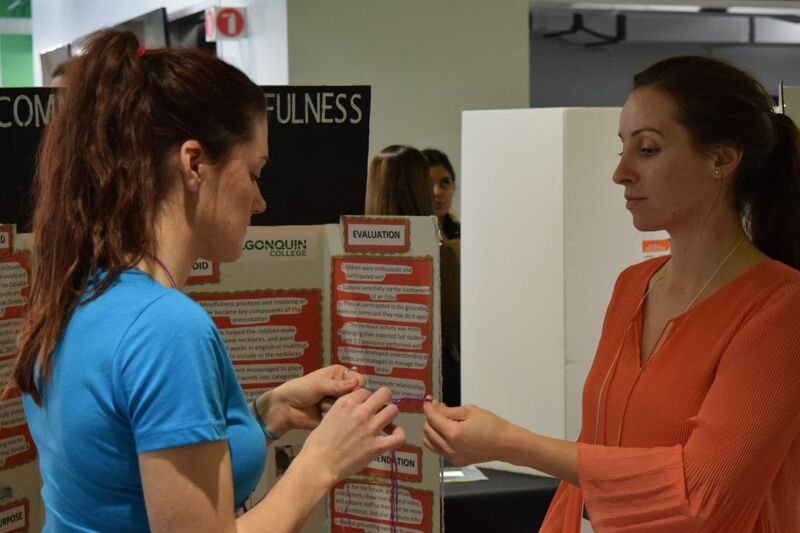 Between 9:30 a.m. and 1:30 p.m. the DARE district played host to the annual RE/ACTION Applied Research Fair for Algonquin students and faculty. The work of 240 students and 17 faculty members was displayed with 81 booths presenting 78 projects. The tables consisted of a variety of different applied research, websites, technologies and innovations. Matthew Jerabek, one of the coordinators of Algonquin’s Applied Research and Innovation office, was in attendance as a mediator. Of the multitude of technologies that were on display, one, in particular, seemed to grab the attention of many at the fair. A tiny metallic fellow who was well ad adverse in 3D Tetris; his name is Jeffrey and he is a robot. Curtis McCartney, a third-year computer engineering student and member of the team responsible for Jeffrey, gave a brief rundown on their creation. “This robotics project began at the start of the semester, the end goal was for Jeffrey to be able to detect, move and place objects autonomously,” said McCartney. While the team is still in the early stages of perfecting their creation, Jeffrey will soon be performing simple tasks on his own. Robotics set aside, there were many websites being showcased. Third-year graphic design students, Alexandra Mines and Jennifer Sommerfeld were responsible for re-developing the Peace and Conflict planner’s website. A website specifically structured to help assist in helping those affected by man-made and natural disasters around the world. The lower level of DARE was dedicated to many students who had either reached out to communities or developed their own innovations to help benefit the average person. 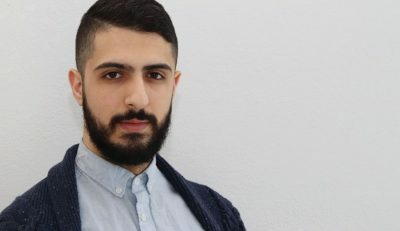 Bradley Talgoy, a fourth-year bachelor of science in nursing student, was adamant in informing students how common the sexually transmitted infection human papillomavirus otherwise known HPV — is in reality. Their app is purpose-built to inform Canadians about vaccines available for HPV, as it is one of the most common STI’s in Canada. According to Talgoy, three in four Canadians that are sexually active will have an HPV infection in their lifetime. Isabel Julien, Katie Macleod-Strove and Jayme d’Entremont, all fourth-year bachelor of science in nursing, were one of the groups that reached out to a very particular community in Vanier. This community was made up of Inuit children at an afterschool daycare program. According to Julien a few other of the children had brought up bullying. So, Julien and her colleagues decided that they wanted to focus their project on mental health. To them, stress and anxiety were an important issue to address. The fair concluded at 1:30 p.m., following the awards that were announced by President Cheryl Jensen. “This showcase is a perfect example of what DARE represents. 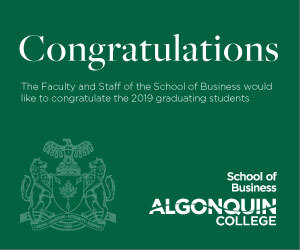 It brings the greater Algonquin college community together around new ideas, new technologies and collaborations,” said Jensen. Re/Action applied research fair celebrates the rise of the machines Reviewed by Keenan Smith-Soro on December 5, 2018 .